It’s amazing how exhausting a three week “vacation” can be. 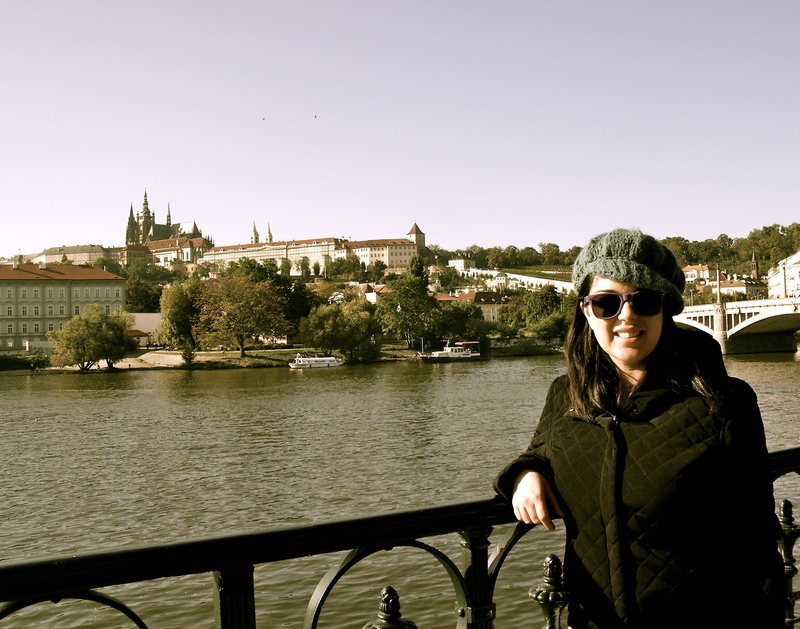 I finally feel recovered from my trip through the Baltics, and thus bringing you part 2 of my trip to Prague. For part 1, click here. 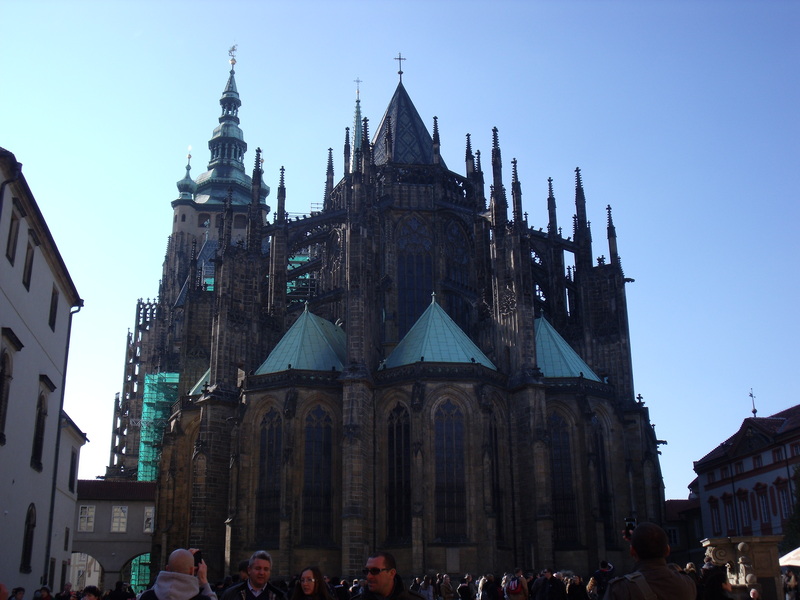 Day 2 According to Lonely Planet, the Prague Castle is the most fairytale-like castle in Europe. That is a bold statement considering that number three on that list is the inspiration for Cinderella’s castle, Schloss Neuschwanstein (Bavaria, Germany). After seeing both, I would have to disagree with Lonely Planet. 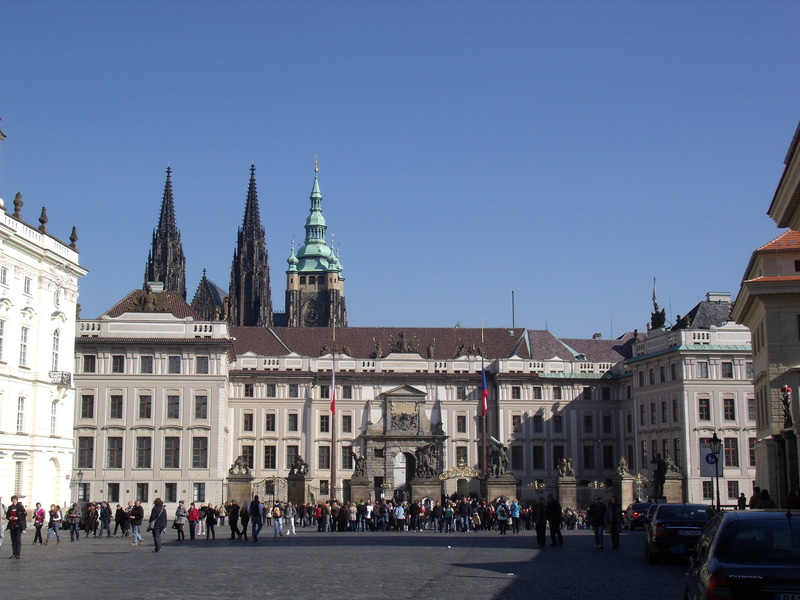 The Prague Castle is definitely one of the most beautiful castles in Europe though, and a sight to see while visiting the city. To call it a castle is somewhat of an understatement. It is more like a little city, complete with streets, a cathedral, palaces and houses. To see everything would take a couple days, but the ‘short visit’ ticket will get you through the main sights in 3-4 hours. If you do choose the ‘long visit’ ticket, rest assured that both tickets are valid for 2 days, so you’ll have plenty of time to see everything. The audio guides were not working the day we went, and on top of that you couldn’t take photos inside many of the sights, so we just walked around, reading the few signs that were in English and taking mental pictures. Tickets for long and short visits to the castle are CZK 350 and 250 respectively. 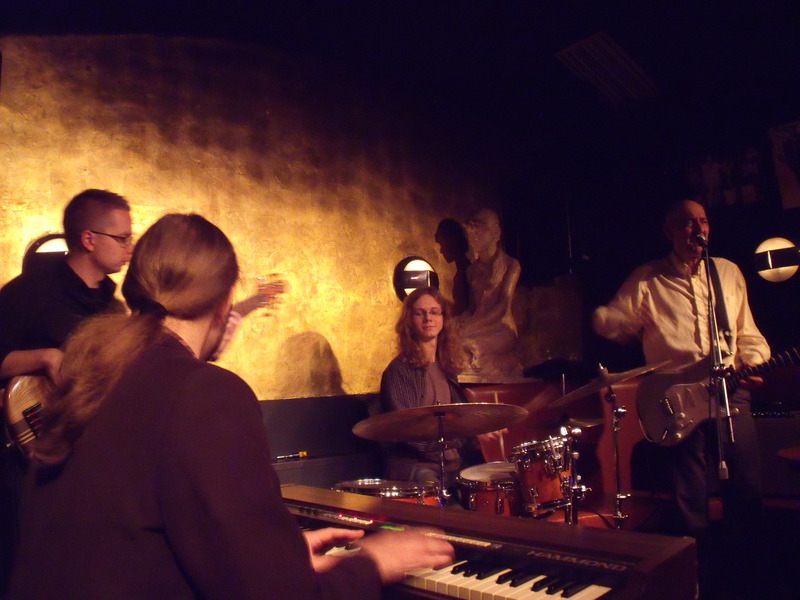 That evening, we booked a table at a famous Jazz bar. 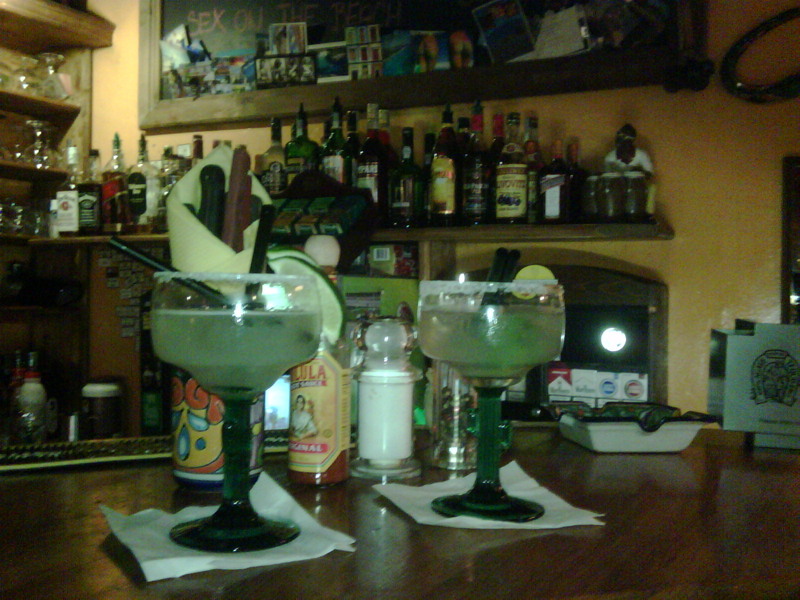 But before we went there, we had to go to Prague’s #1 Mexican restaurant, Cantina. 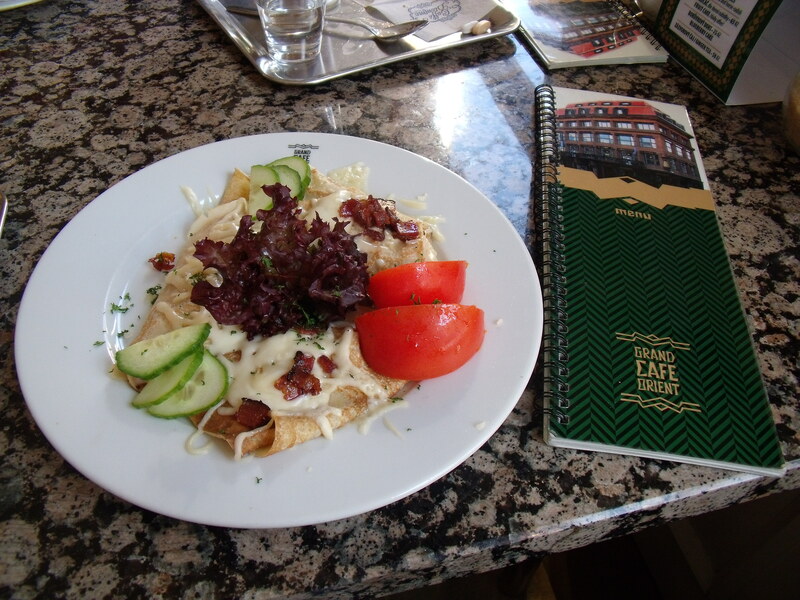 I’ll admit that I stumbled upon this restaurant after browsing Lonely Planet as they rank it very high up on their list of places to dine in Prague. Despite our trepidation (Mexican food in Prague? Seriously?) we decided to check it out. It turns out that the Cantina is a very popular restaurant in Prague, and when we tried to book a table that afternoon, we were told they were completely booked. We stopped by anyway and ended up getting a spot at the bar. The food was decent enough considering our proximity to Mexico and the margaritas weren’t too bad either. The restaurant is small though, and I got the impression that even with a reservation parties of two still end up at a small cramped table. 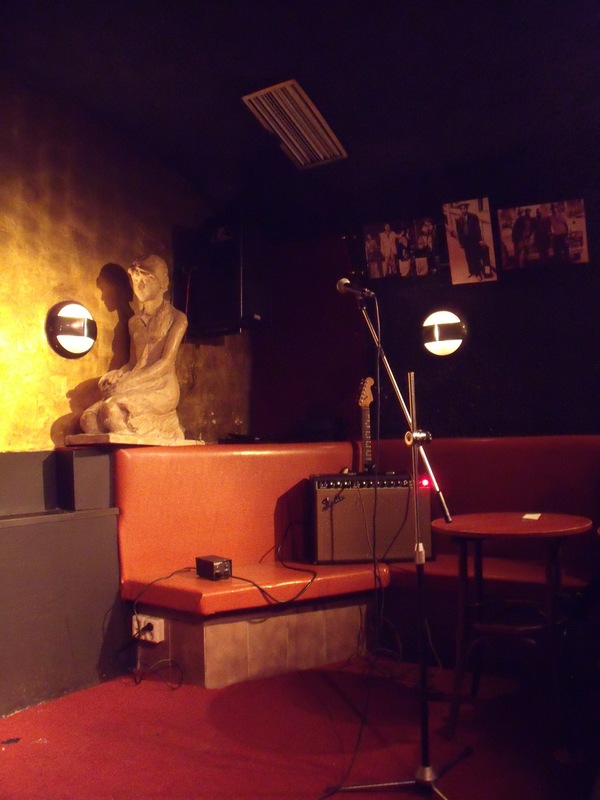 The jazz bar we went to was called U Maleho Glena. This was another place we had to book a table at in advance. The ‘club’ is tiny, but they packed at least 30 people into the room. The music was good, as were the cocktails. 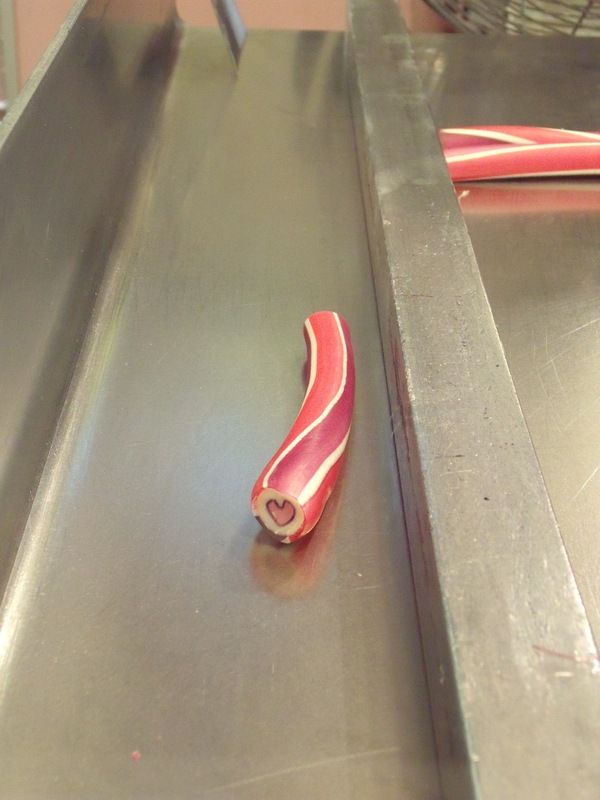 The service, on the other hand, was not so good. We ordered a second round of drinks during the break between the first and second set, and the server did not bring them out until after the second set. The bar was very busy, but the people next to us ordered after we did received their drinks promptly while ours seemed to be forgotten. Still, the music was great and it was well worth stopping by to hear some great music. Day 3 On our third and final day in Prague, we decided to just roam around the city and take in some of the unique sights. 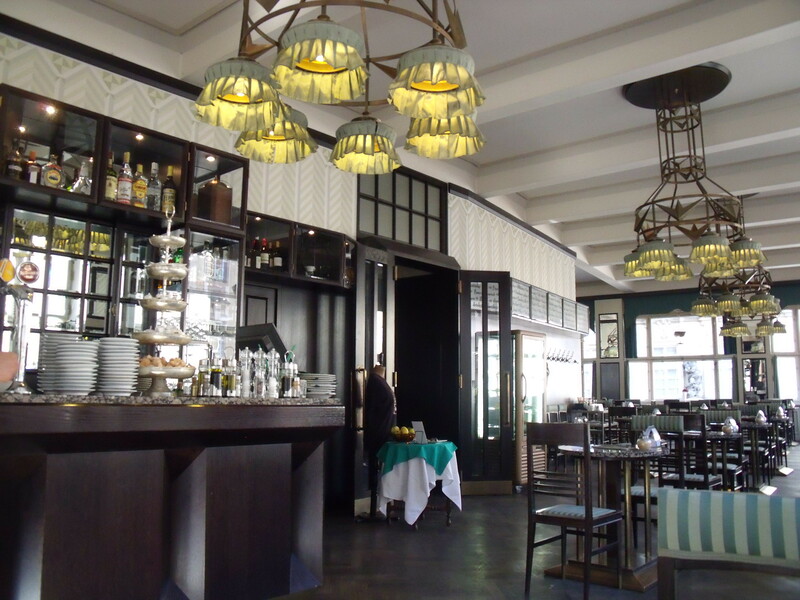 We started the day with brunch at the Grand Café Orient. The food was divine and it was made even better by the beautifully decorated room. The café was built during the Cubism movement, which is reflected in the design and décor of the café. Later in the day, we strolled over to U Medvidku, home of XBeer-33, the Strongest Beer in the World (their words, not mine). Unfortunately they had sold out of this particular beer so we had to settle for one of their other brews. If you’re interested in trying the XBeer-33, I don’t recommend going on a Sunday. 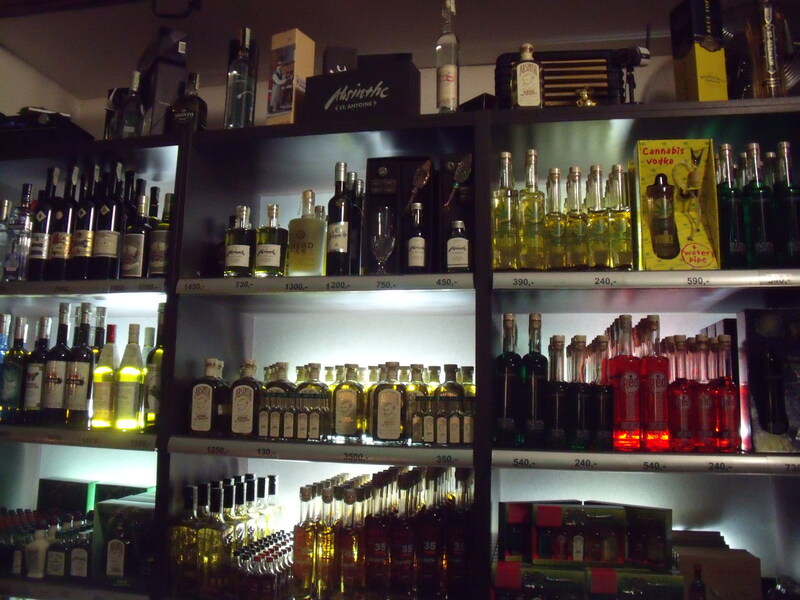 Yes, we had a glass, and I can say with utmost certainty that I do not enjoy absinth. Perhaps it’s an acquired taste, or maybe it’s not and the green fairy alone makes it all worth it. Well, there was no green fairy that evening or buzz of any sort for that matter. I think I’ll just stick to my vodka sodas from now on. That brings me to the end of my Prague weekend break. I highly recommend a stop in this city if you have time during a European trip. It only needs 2 days really, food and drink are super cheap, and it’s a very easy city to get around. 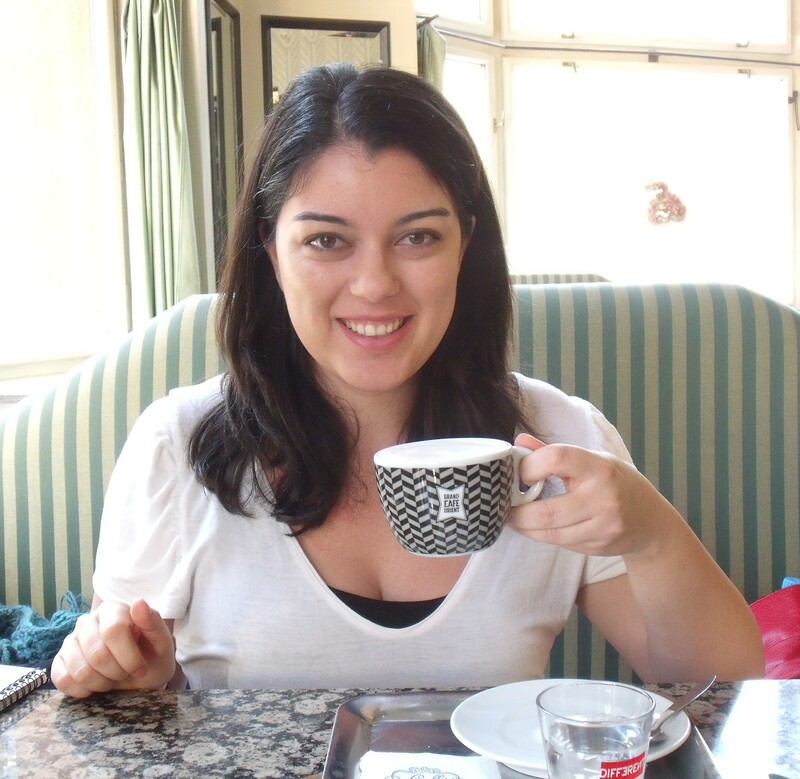 You can catch up on the first two parts of my Greek Holiday here. After Athens, we flew down to Santorini for three days. 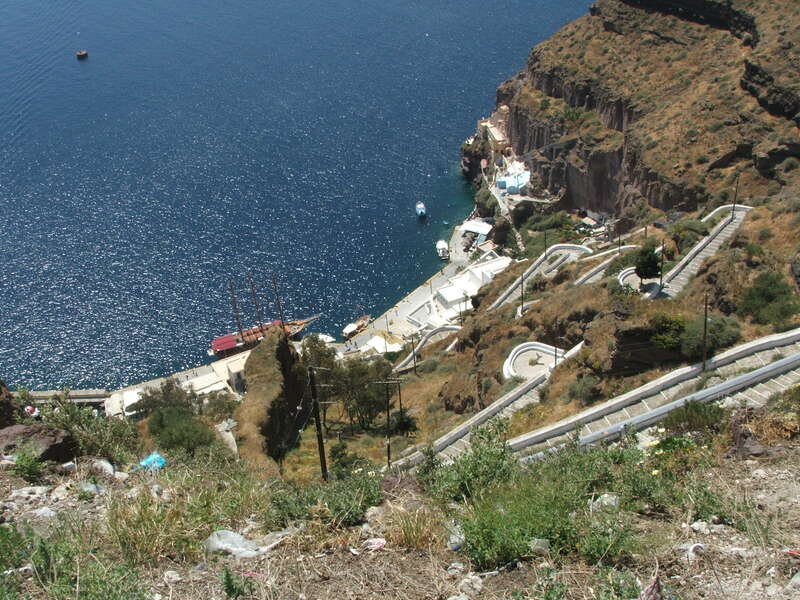 Santorini is one of the many Greek island in the Cyclades. 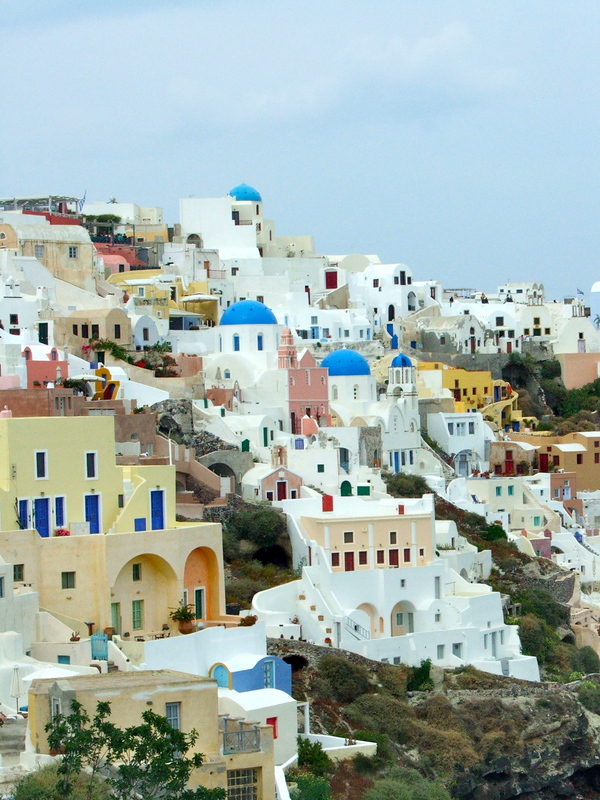 It is known for the famous white buildings and blue roofs that can be found scattered around the entire island. It is also has some nice beaches, although the weather was not exactly warm enough to enjoy the beach while we were there. 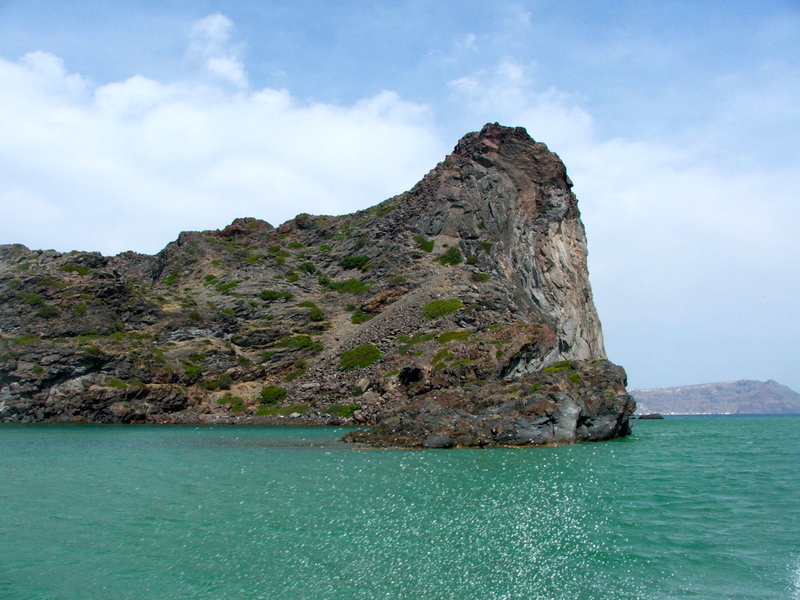 There are three or four popular towns on the island: Fira, Oia and Kamari. 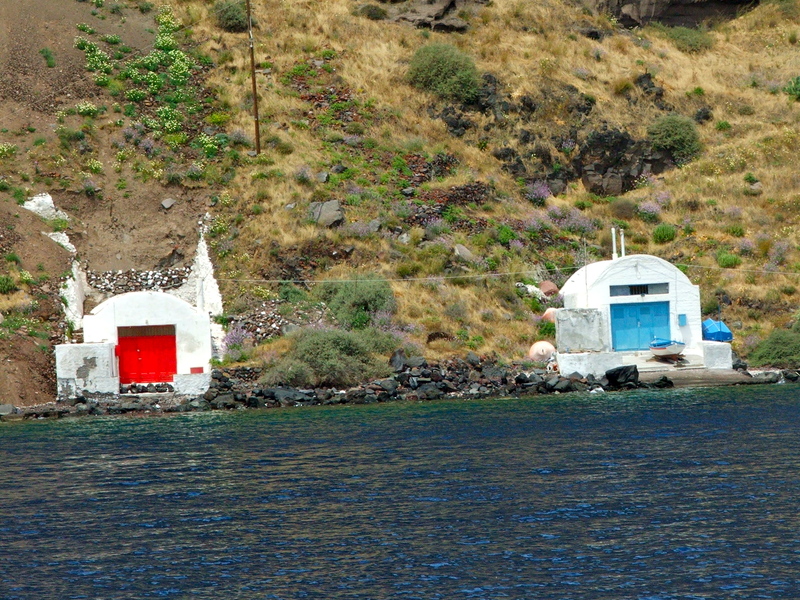 We stayed at the quaint Hotel Anassa in Kamari, which is on the southeast side of the island, near the airport. Kamari can best be described as a beach town. A long strip of restaurants, bars and shops line the beach and offer both indoor and outdoor seating. 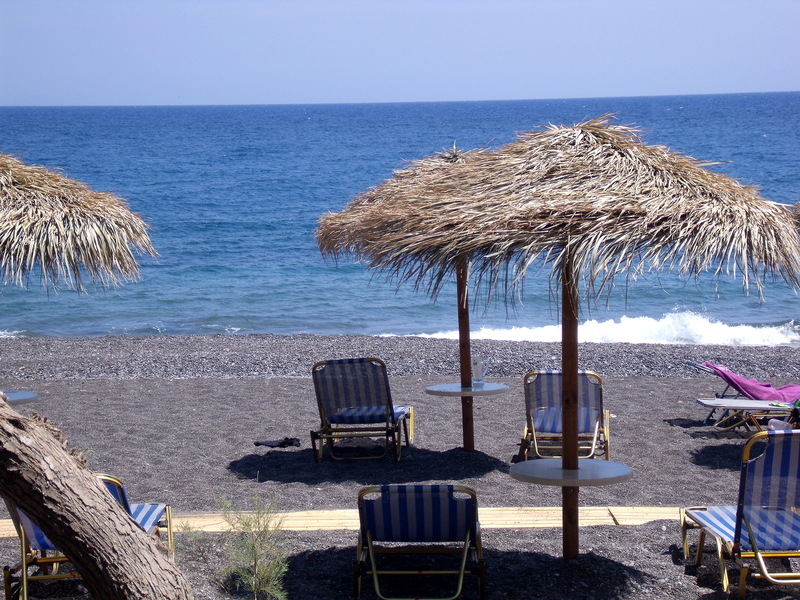 A number of the restaurants even had their own beach chairs and umbrellas for customers. One of these restaurants is the Prince Bar & Restaurant. After getting settled at the hotel, we took a walk down the main road in Kamari and decided to have a late lunch at the Prince mainly because it was the busiest of all the restaurants. Patrons equal good food and service right? Well, in this case, it did. The weather was perfect, so we sat outside and took in the weather, the view and the delicious food. 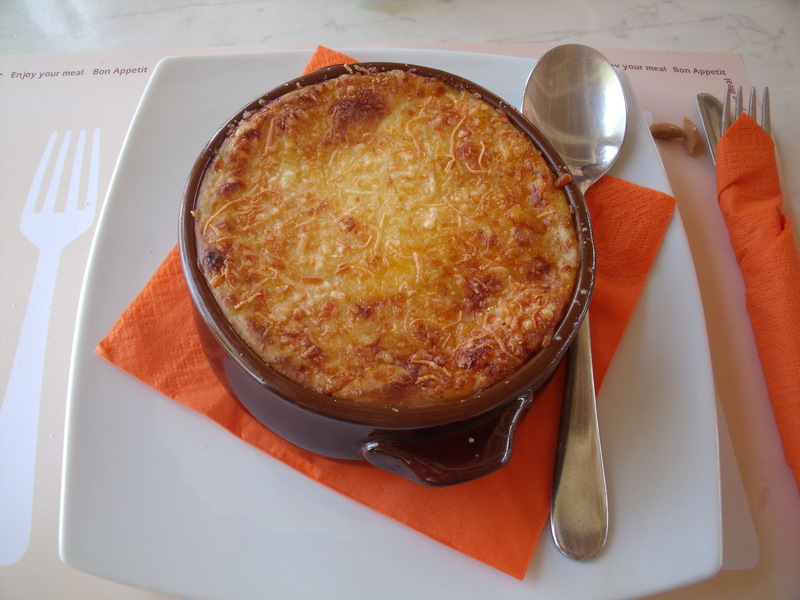 For lunch, I chose to order the moussaka. It was delicious! Of course, being on holiday and with the weather so nice, enjoying a beer with lunch was a natural choice 🙂 The service at Prince was great and the servers were extremely nice. We enjoyed it so much that we ate there again on our last day. 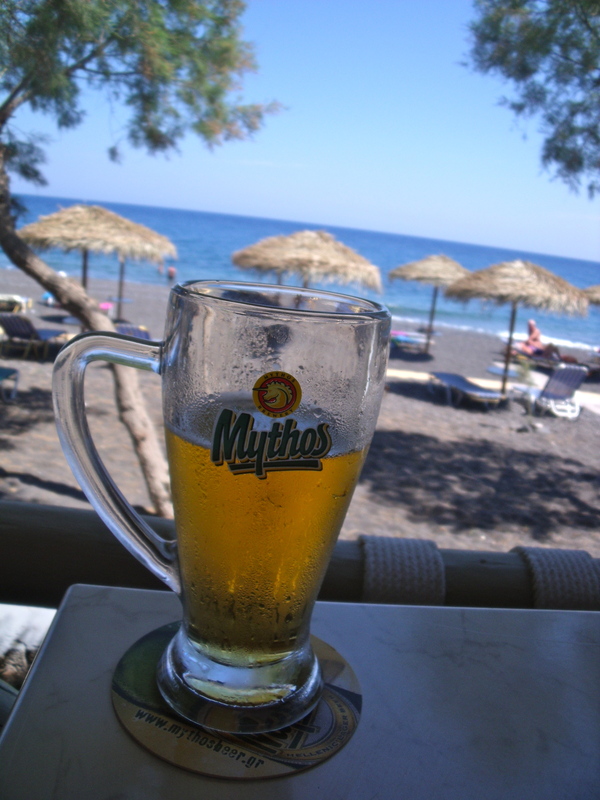 I absolutely love Mythos Beer! That evening, still full from our late lunch, we decided to just take a walk through Kamari and perhaps stop in somewhere for coffee and dessert. I’m not sure if it were there early in the season, or if it evenings in Kamari are generally quiet, but there weren’t every many people out. 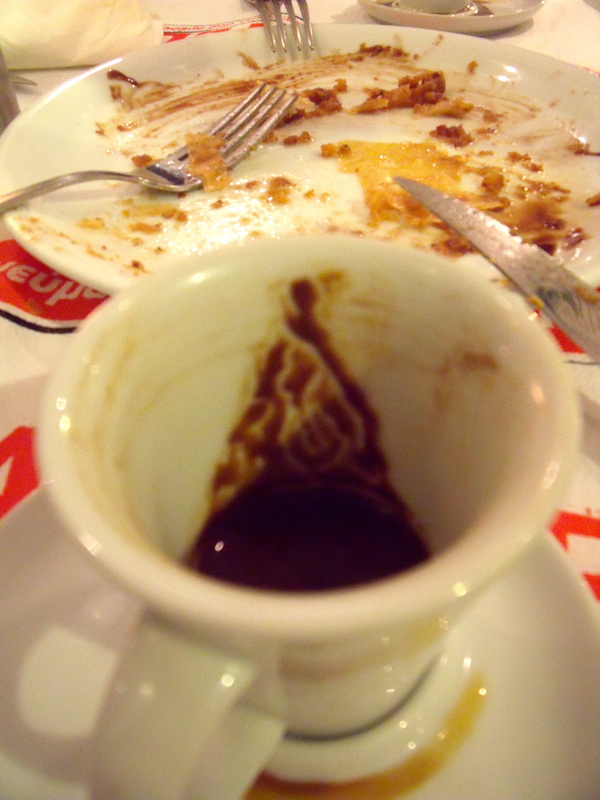 Greek coffee is most similar to Turkish coffee, so mom had the brilliant idea that we should turn them over when we finished and attempt to read our fortunes. 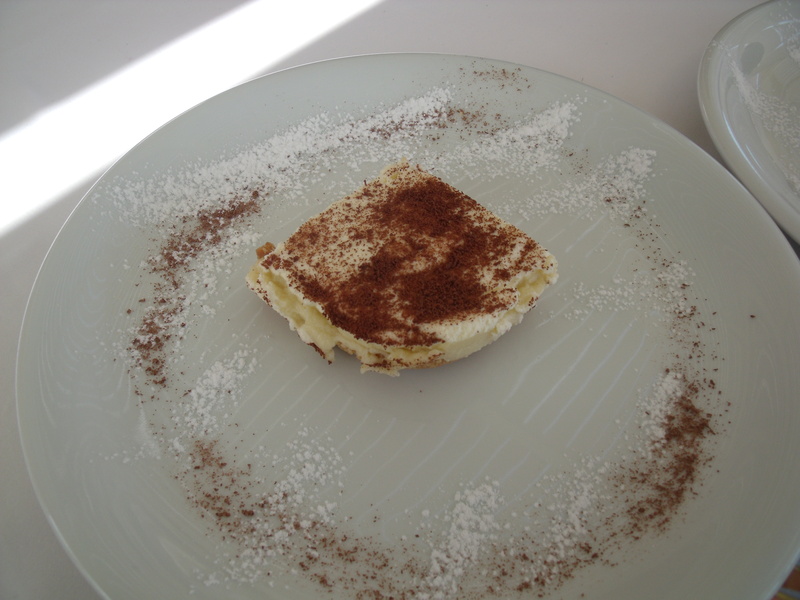 This practice is known as Tasseography, and you can read more about it here. So what was my fortune? Well, here’s a photo of my cup. Feel free to comment with you think you see. What do you see in the coffee grinds? 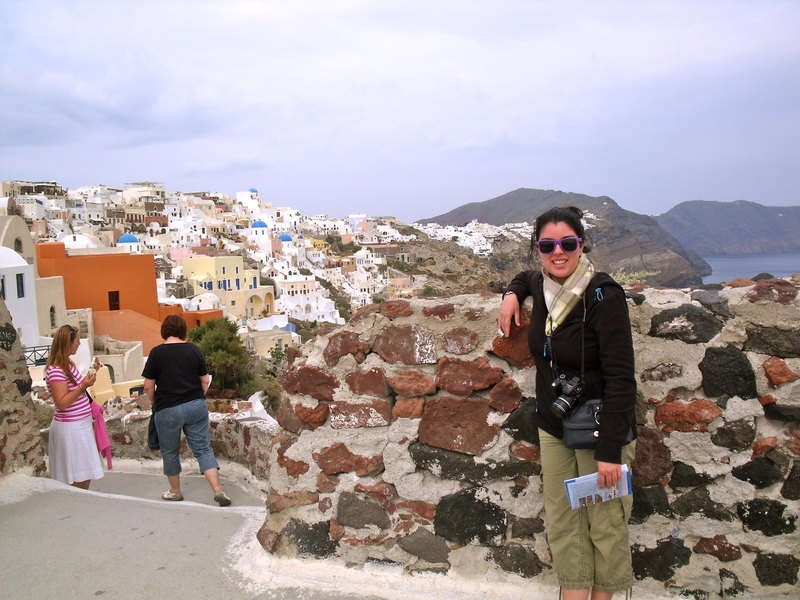 On our first full day in Santorini, we decided to explore the town of Fira. 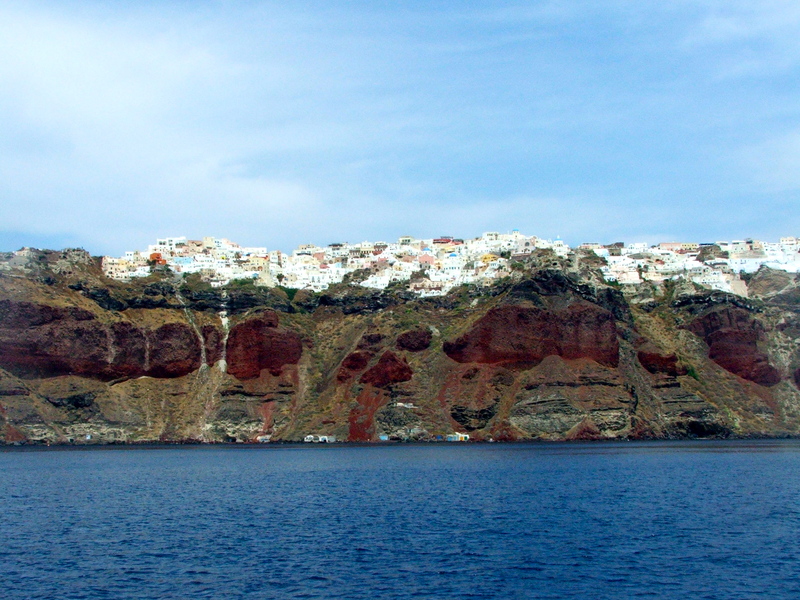 Fira is the capitol of Santorini and it is the most central of all the towns. 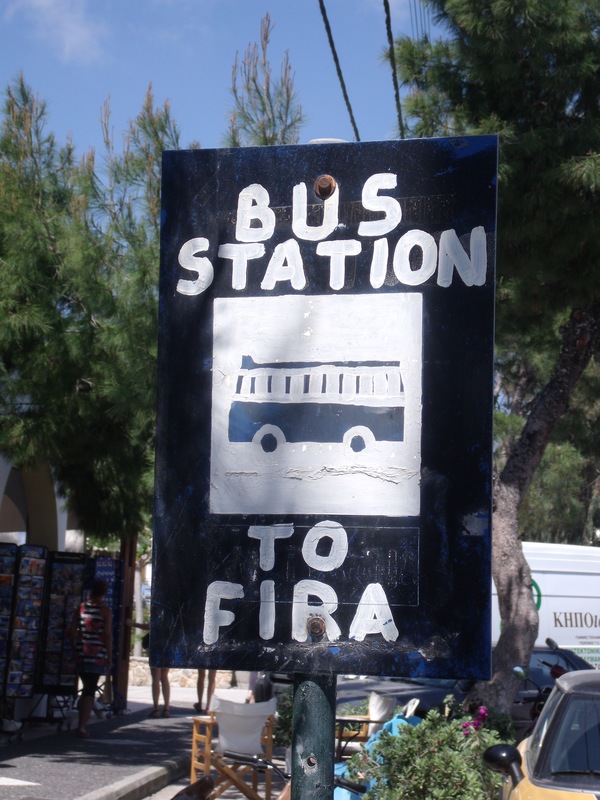 All of the local buses go through Fira and it is arguably the most popular with tourists. *Side note – Local buses are not frequent, but they are on time. Check the schedule, and arrive 10 minutes or so before the time. 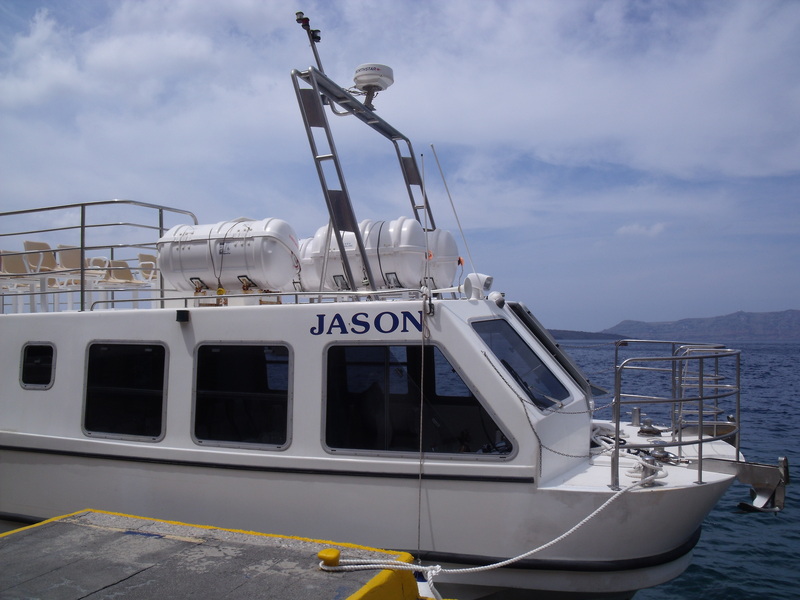 The cost was around €2 per person, and tickets can be purchased on the bus. 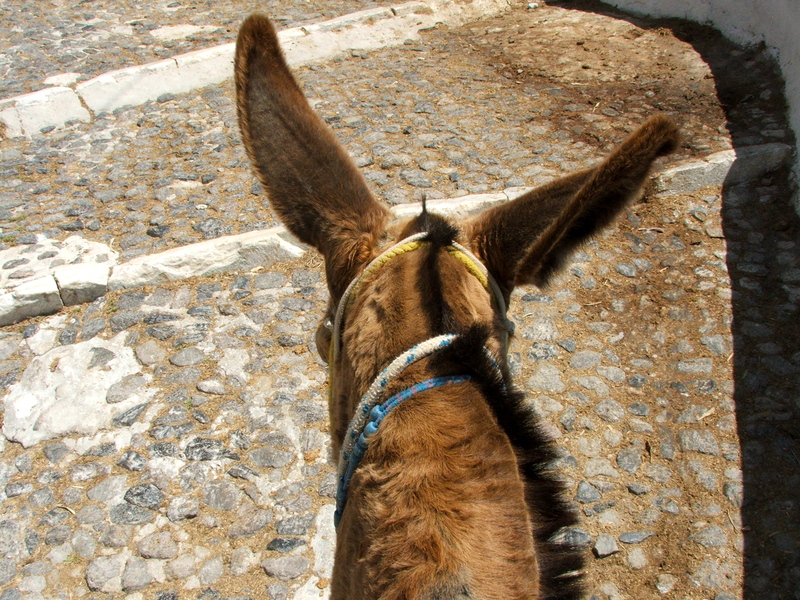 There was one historical museum in Fira, but otherwise it is a great place to walk, shop, eat and ride a donkey. 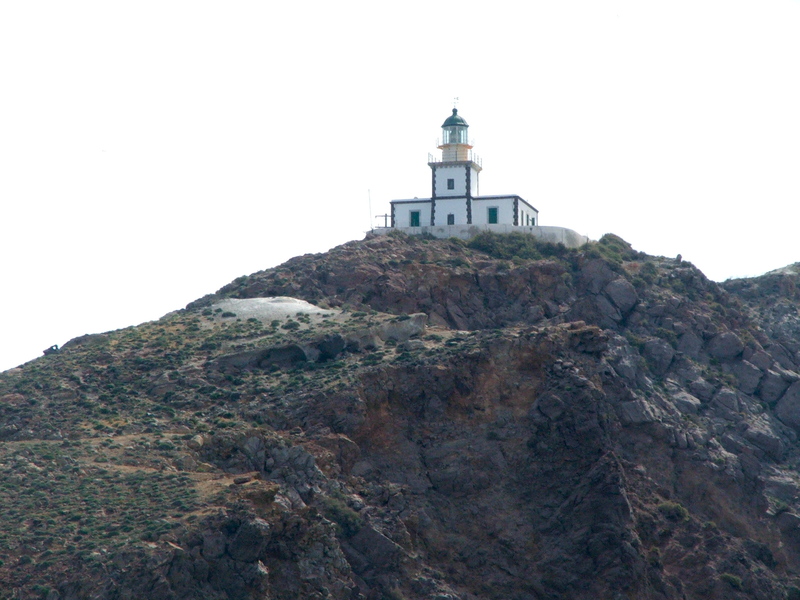 The town of Fira is at the top of a steep mountain by the sea. This was also the location of the old port. Thanks to modern technology, a cable car has been built to transport people from the town to the old port and back. However the old path that zigzagged up the mountain is still there, as are the mules that would carry people and their things up and down the mountain. 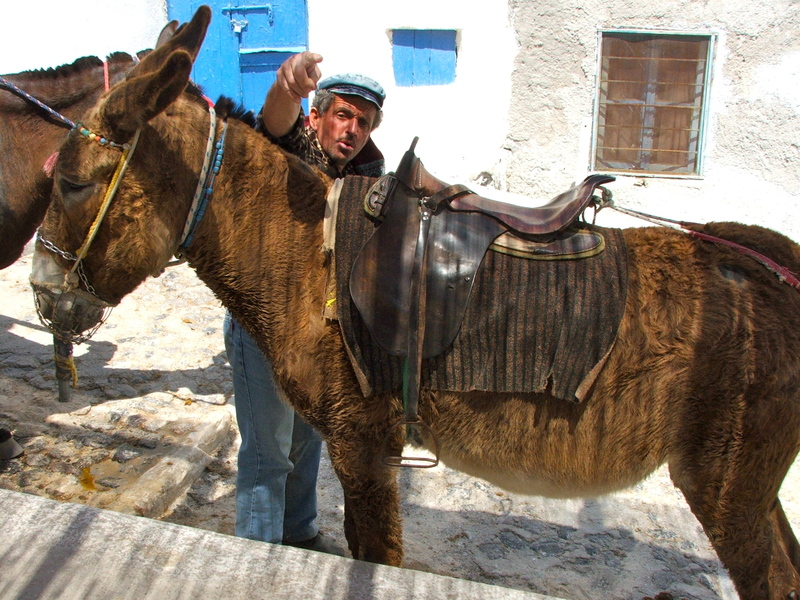 These days visitors have three choices when it comes to getting up or down the mountain: the cable car, walking the old path, or riding a mule. 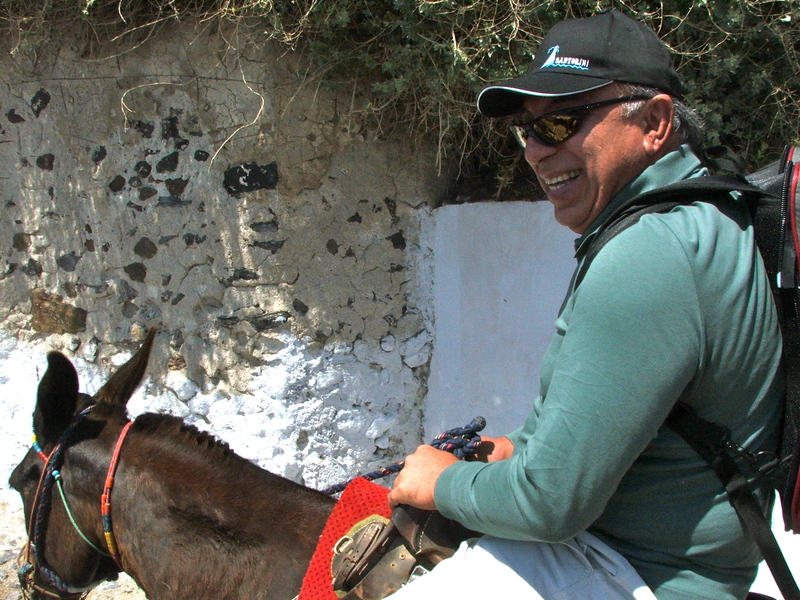 My dad and I chose to take the cable car down and then ride the mule back up the mountain. I think this was the best decision considering how bumpy the mule ride was and how scary that would have been going down hill. Mom took the safe route back up on the cable car, but that meant she was able to get some photographs of us embarking on our journey. All smiles on the way up! Even dad was having a good time! When we safely made it back to the top of the mountain, it was time for lunch! 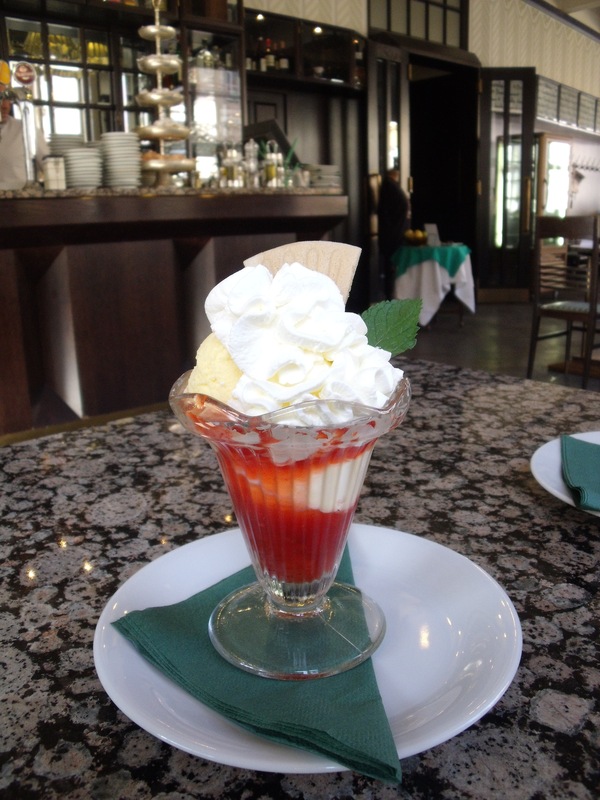 I did some research and found a fantastic place called Ellis Restaurant in Fira. Ellis is tucked away on the mountain, but very easily accessible and boasts a magnificent ocean view. 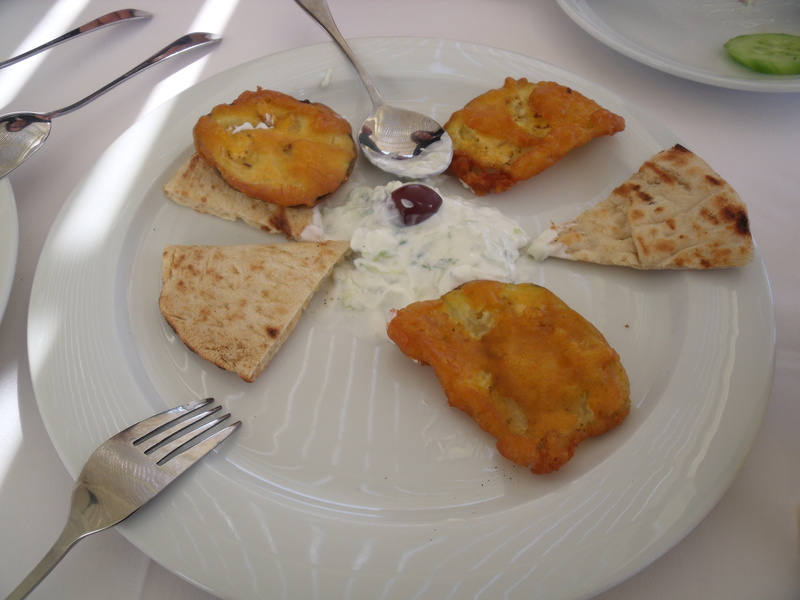 The highlight here was, without a doubt, the beer battered eggplant (aubergine) with pita and tzatziki sauce. It was delicious! Their Greek salad at Ellis was also one of the best (and prettiest) we had on the trip. Again, the service here was fantastic, and I’m not just saying that because the waiter brought us free homemade dessert! I would definitely say that Ellis gets the award for best meal in Greece. 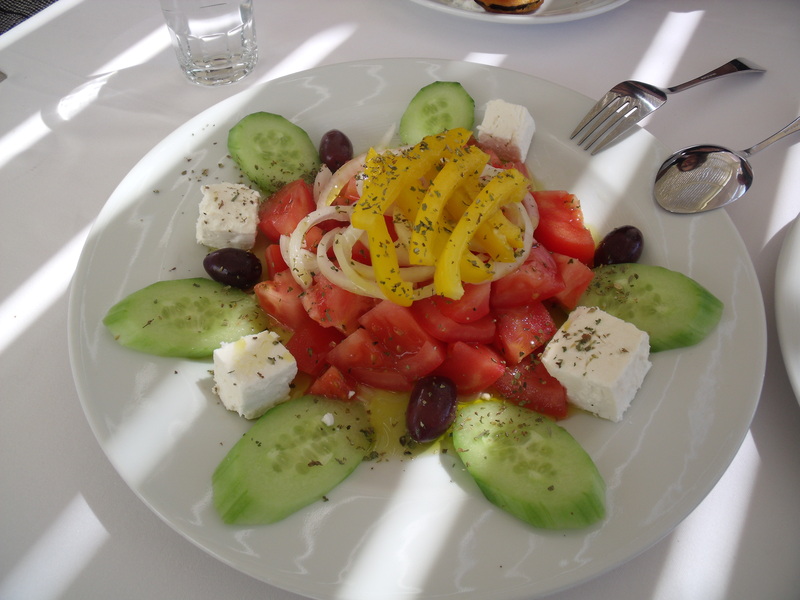 If you’re ever in Santorini, be sure to have a meal there! 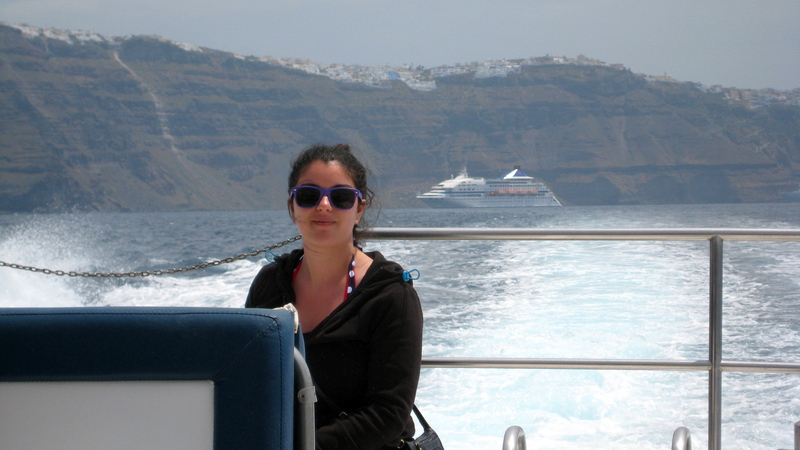 On our last full day in Santorini, we booked a boat excursion around the island. Now, had the weather been about ten degrees warmer (Fahrenheit), this would have been a fantastic way to spend the day. 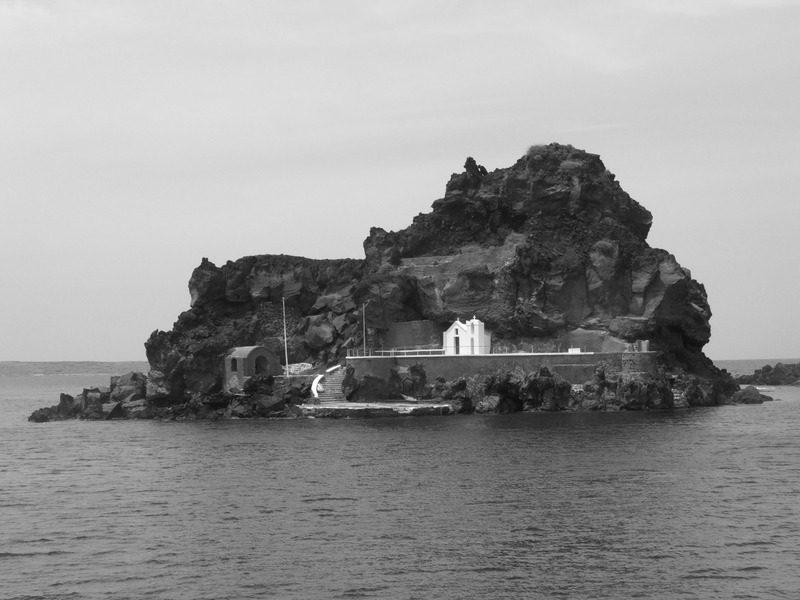 The boat made stops so you could go swim, and took us from the southern part of the island all the way to the northern town of Oia. Needless to say, we did not swim, but at least got a great view of the island from the water. 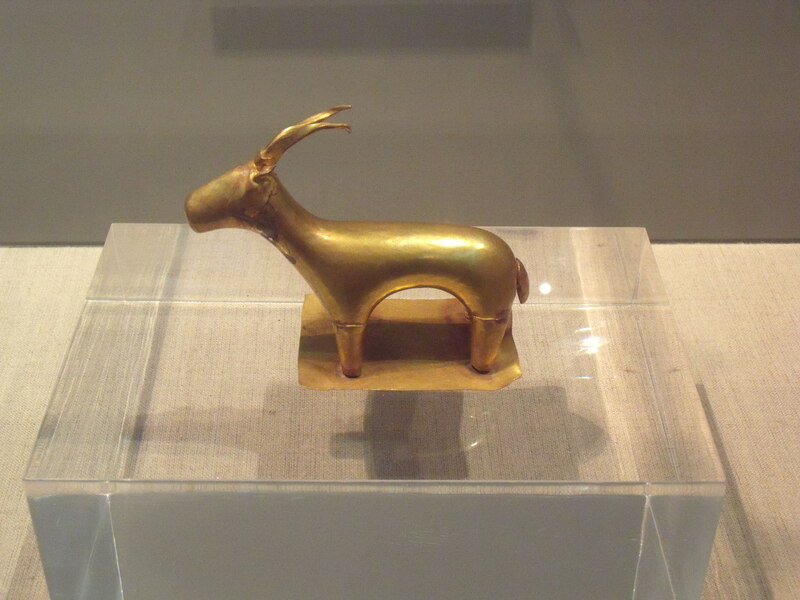 I was also dying to visit Oia (pronounced E-ya), so it was still a great day. 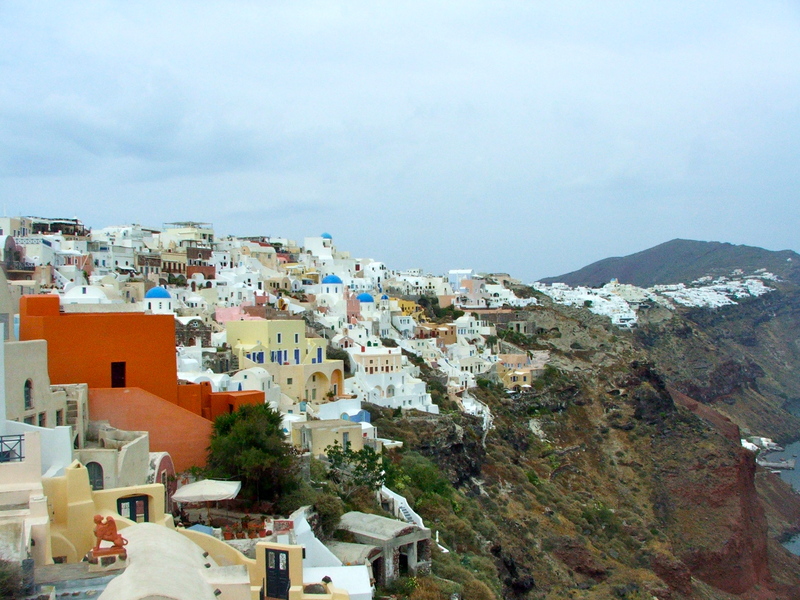 Oia is most famous of the white buildings and blue roofs. 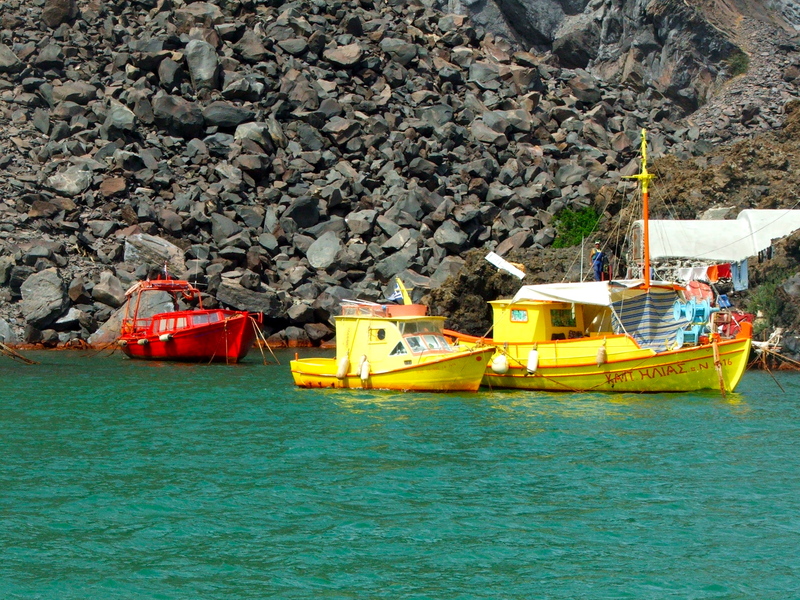 That combination can be found throughout Santorini, but the ones in Oia are the most photographed and recognized. 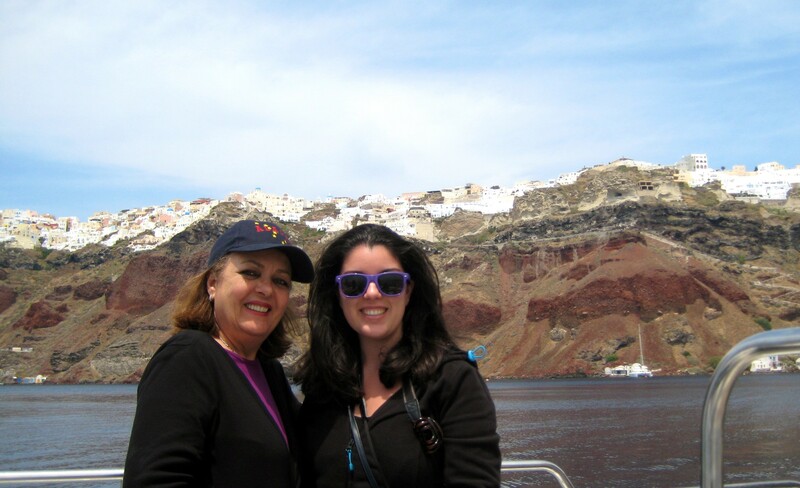 Here are some photos from our amazing day on the boat and our visit to Oia. 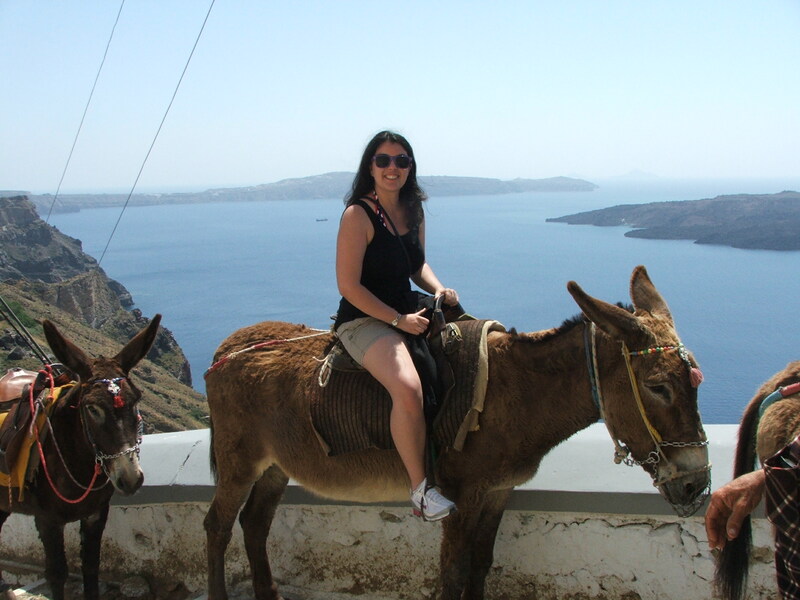 And that concludes our trip to Santorini! 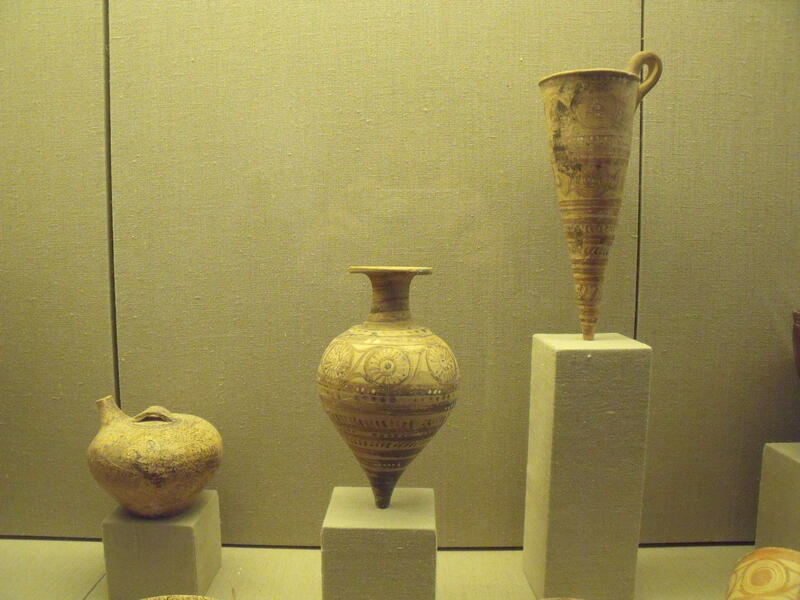 Stay tuned for the fourth and final part of my Greek holiday, as we head to the island of Crete. 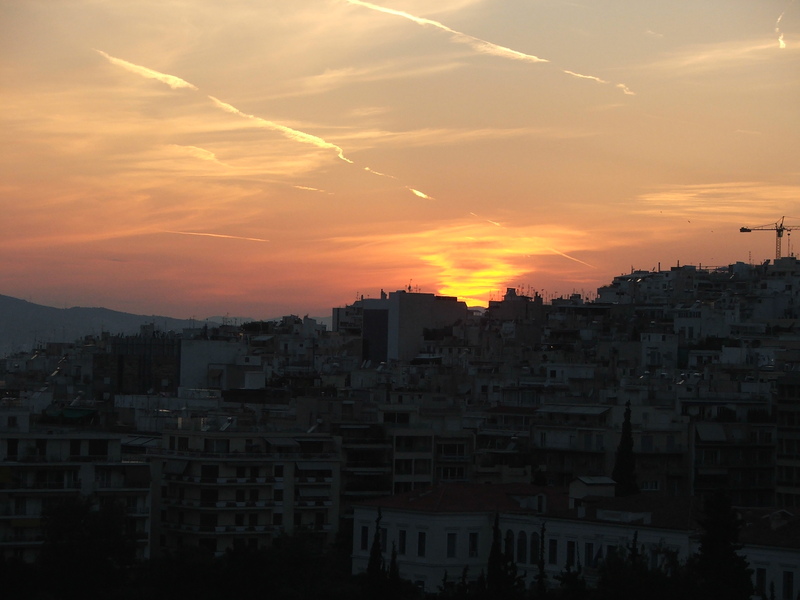 If you missed part 1 of the Greek Holiday series (oh yes, it is going to be a series), just click here. 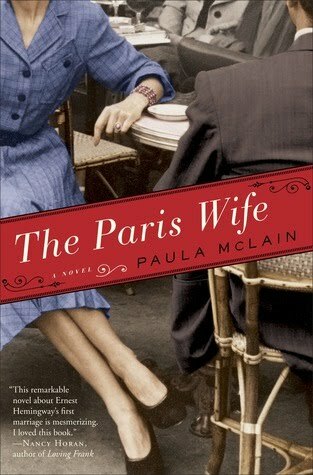 Now, onto part 2! 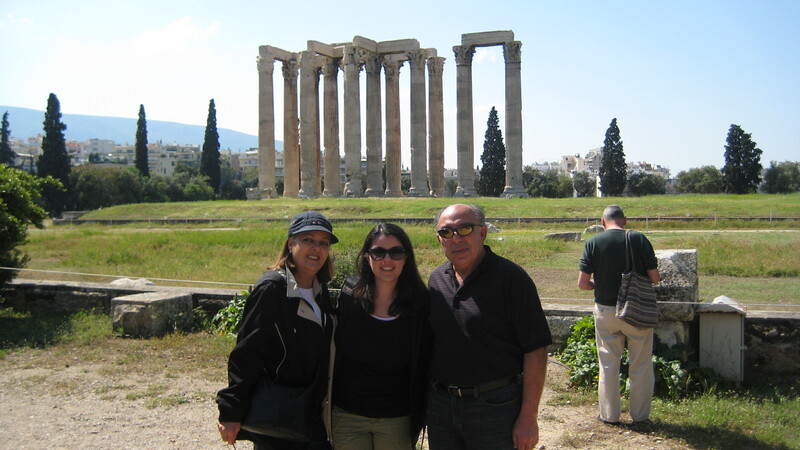 On our second day in Athens, we continued our Greek God quest by kicking off the day at the Temple of Zeus. 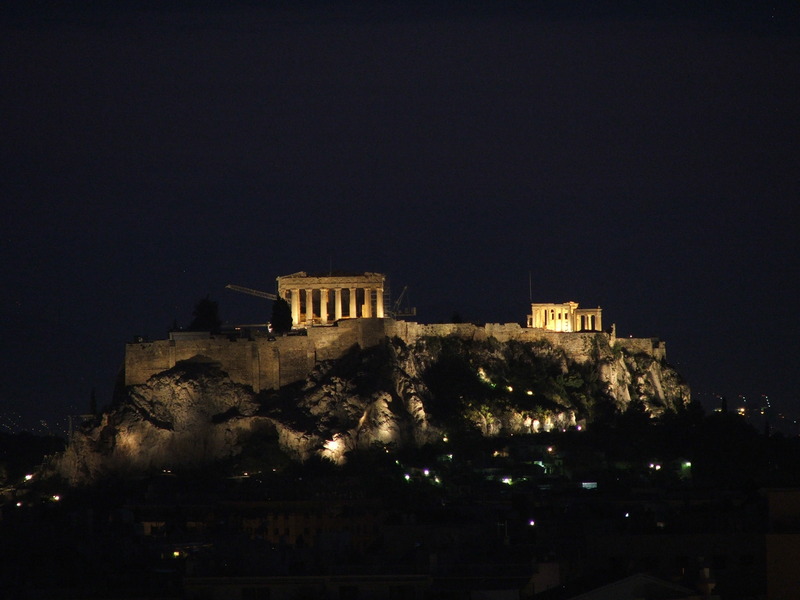 The building was commissioned by the tyrant ruler of Athens, Peisistratos in 515 BC, but after his fall, the people refused to continue building. It was picked up again for 9 years between 174 BS and 163 BC, and finally completed in AD 131 by Emperor Hadrian. 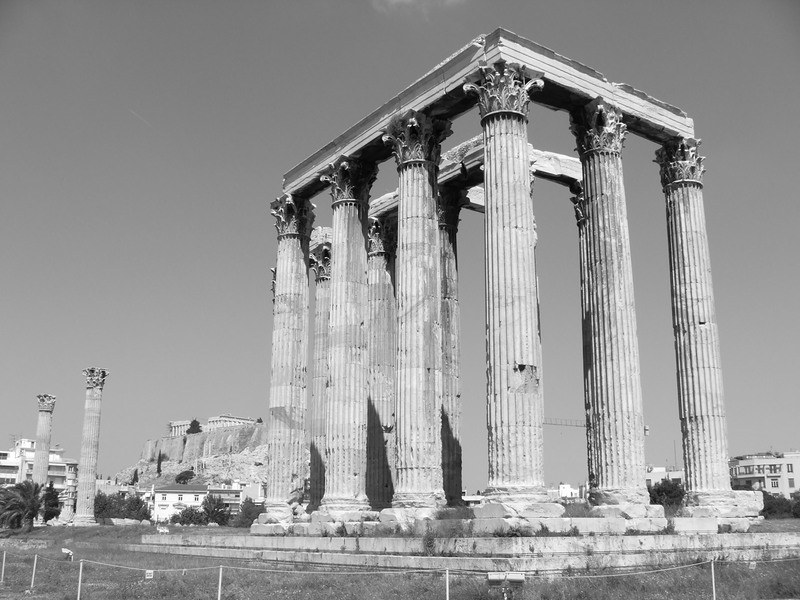 Originally there were 104 columns, but only 16 remain standing now. A number of smaller temples also stood on those grounds throughout history, however very little remains now. At the far end of the grounds, there is a beautiful arch named after Hadrian. 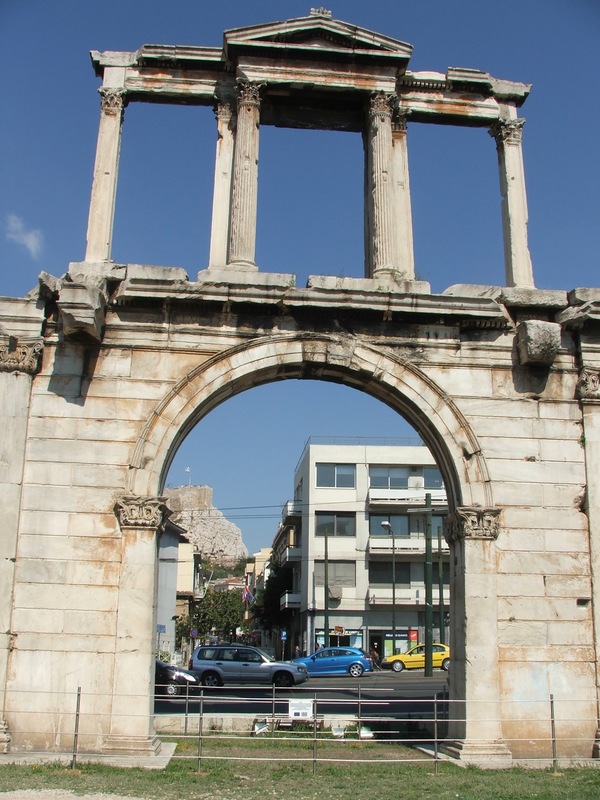 Is there a major city in Europe that doesn’t have an arch? Feels like most of them do. After the Temple of Zeus, we made are way back to the foot of the Acropolis where the Dionysus Theatre is located. The theatre is named after the god of wine and patron of drama, and seated around 15,000 people. 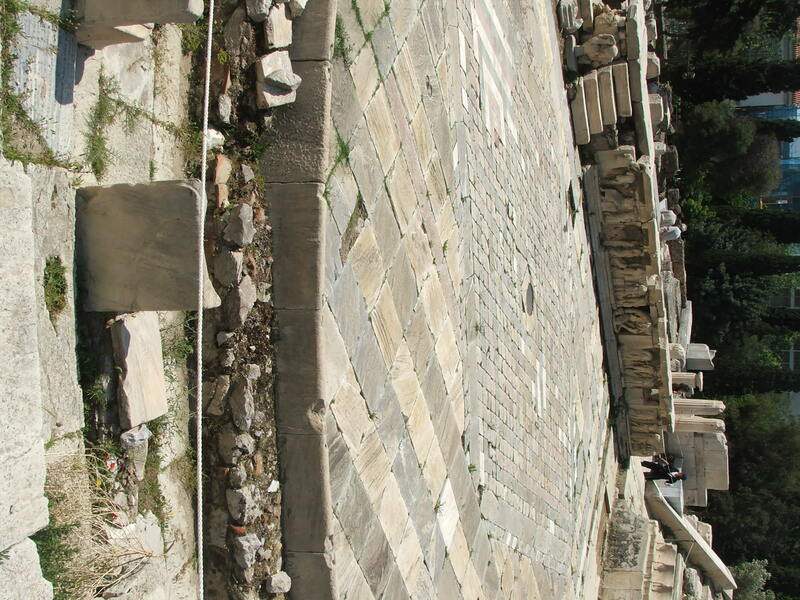 Built in 325 BC, tragedies and comedies by playwrights like Sophocles and Euripides were performed at the theatre. 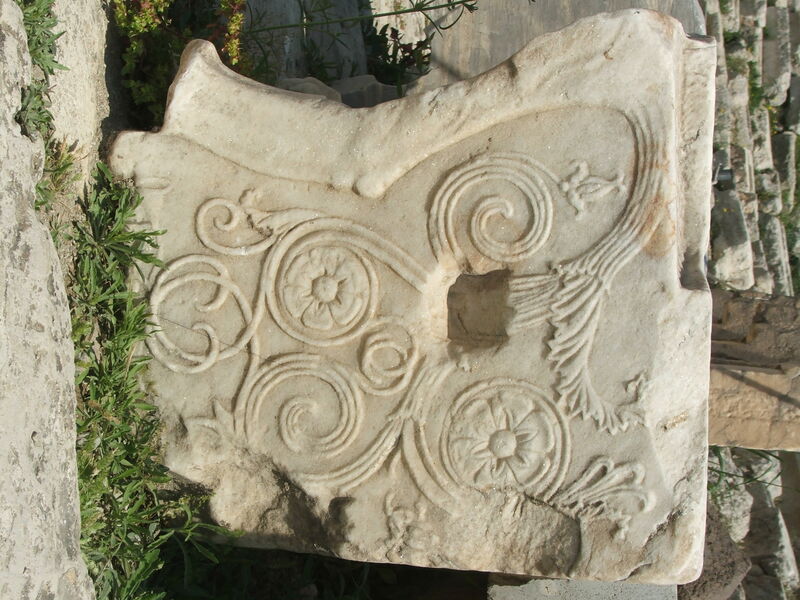 The theatre was located near the temple of Dionysus, and the seats in the front row were reserved for the priests of Dionysus. 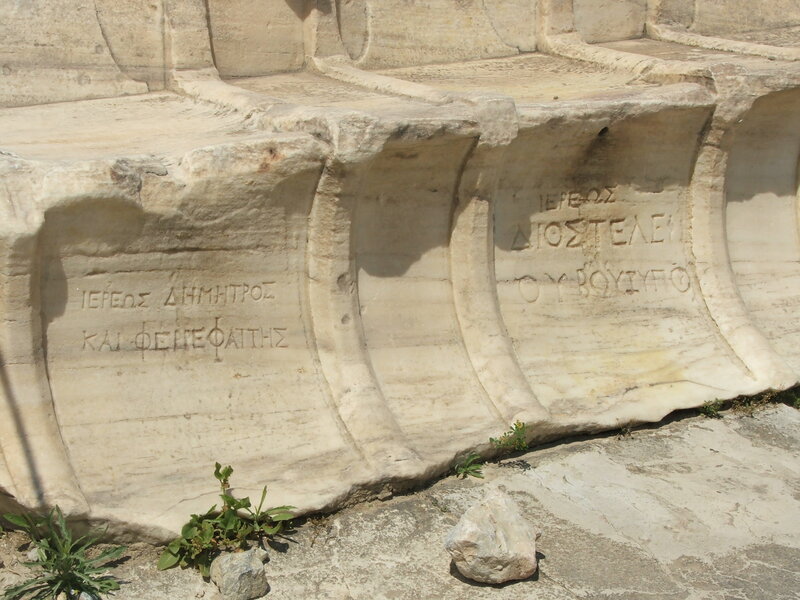 The seats in the front row still contain engravings, perhaps indicating who the seat was reserved for. The theatre eventually fell into disuse, but was went under some restoration in 61 AD by the Roman emperor Nero. That evening we went to a quaint, family run restaurant near our hotel. 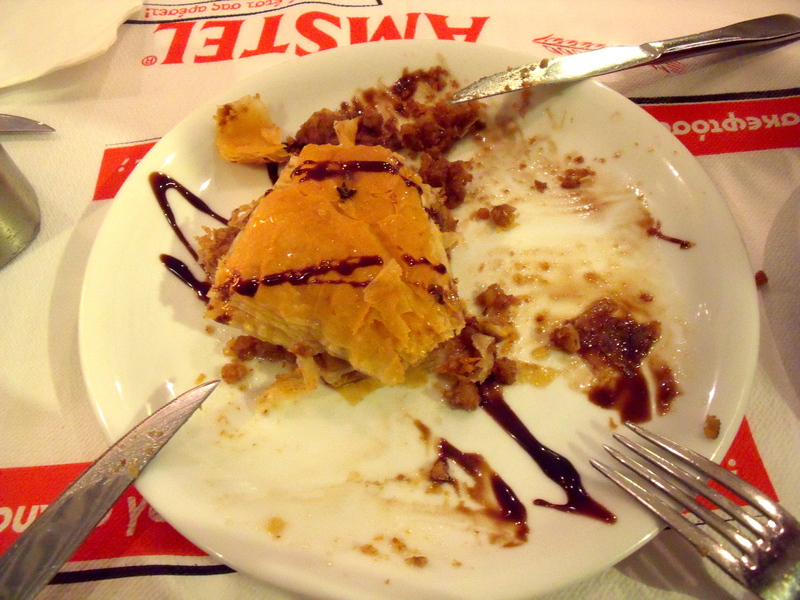 Tucked away at the bottom of Lykavittos Hill, To Ouzadiko offers traditional Greek food at reasonable prices. 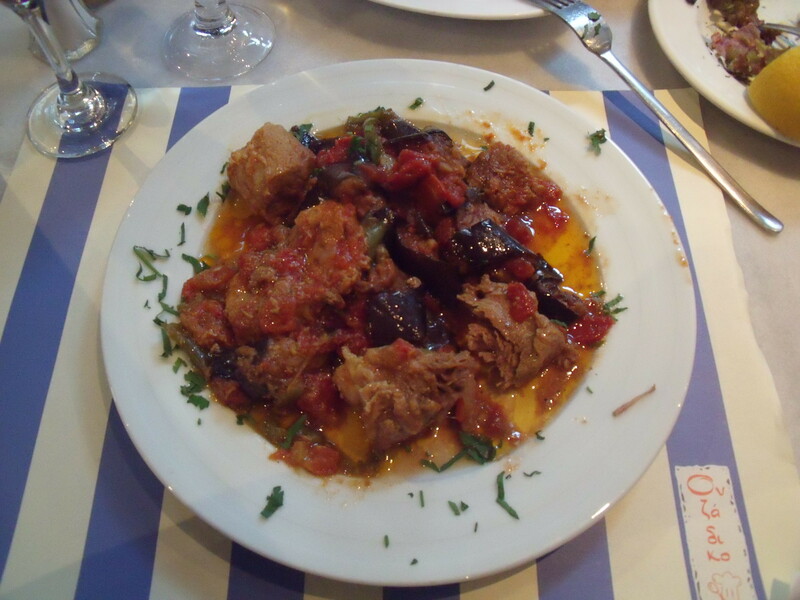 I ordered a delicious lamb and eggplant dish. When we finished dinner, we headed back to the hotel, the Hilton, where we had access to the executive lounge. The lounge is only available to guests staying on the top three floors, and every day they offered breakfast, afternoon tea/coffee and cakes, and evening cocktails and appetizers. 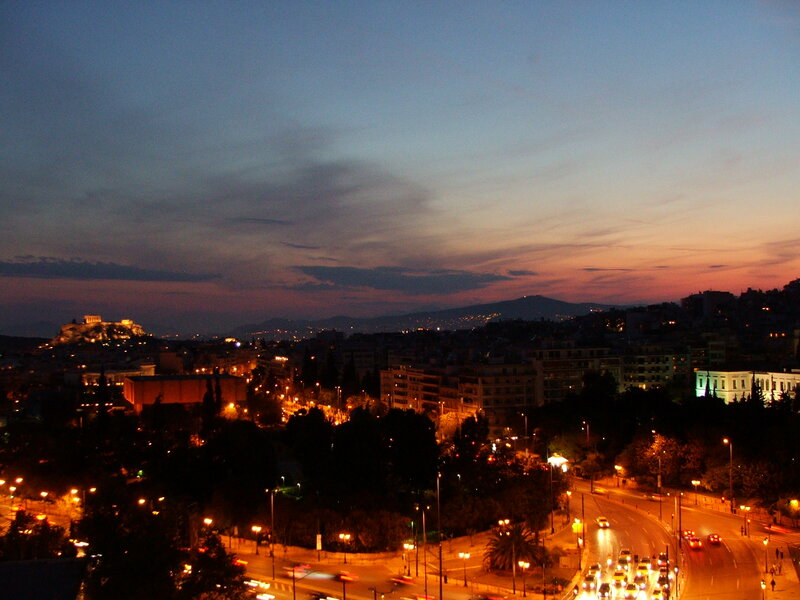 All of this can be enjoyed on the fantastic balcony, which happens to have a view of the Acropolis. This also meant we had a fantastic view of the sunset every night. And that sums up the Athens portion of my Greek Holiday! 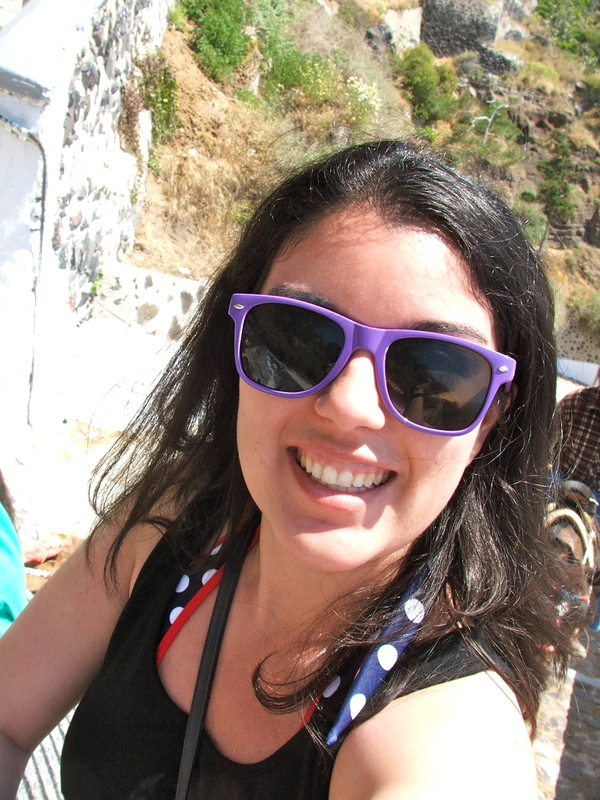 In part 3 of the Greek Holiday series we head to Santorini! Check back soon, or just sign up for the mailing list to stay up to date on blog posts. We're all busy, so why not make life a little easier? Enter your email address to subscribe to my blog and receive notifications of new posts by email.